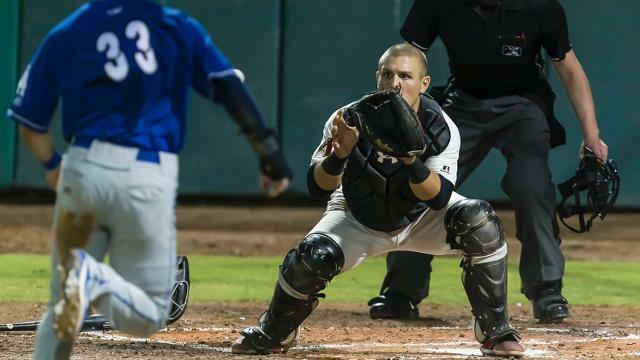 VISALIA, CA - Though Visalia took an early lead behind a dominant Riley Smith, it was the powerful bats of the Rancho Cucamonga Quakes that prevailed in the opening game of the California League Championship Series in a 5-4 final. Visalia (3-3) took a 3-0 lead, all started by a Daulton Varsho solo homer, a lined shot to right. Visalia added on two more in the inning on a double by Ramon Hernandez and a base hit by Anfernee Grier. Meanwhile, Rawhide starter Riley Smith was in cruise control, having set down each of the first twelve hitters he faced. But then in the fifth, the top-ranked Quakes offense started rolling. Rancho Cucamonga (4-1) put together a three-run inning, though Smith nearly escaped unhurt. The Quakes had runners on the corners and one out when Donavan Casey hit a slow roller to third. Drew Ellis bare-handed the ball and gunned down Connor Wong at the plate for the second out of the inning. But Nick Yarnall followed with a game-tying three-run homer to left. Not a surprising result from the team that came within 15 home runs of the California League all-time record. The Quakes took the lead in the top of the sixth, seizing advantage of a Drew Ellis error to load the bases with one out. With a 3-1 count on Jared Walker, Smith delivered a fastball that was ruled to be below the knees, bringing home the go-ahead run in a 4-3 game. Rancho Cucamonga pulled starter Leo Crawford after five innings to get to their dominant bullpen, starting with Yimi Garcia, who struck out the side following a leadoff walk to Daulton Varsho. Parker Curry followed in the seventh and struck out Jasrado Chisholm before Ellis followed with a laser home run to left, his first shot in nearly a month to tie the game at 4. West Tunnell tossed a perfect eighth and Curry (W, 1-0) followed suit, setting up closer Matt Brill to pitch the ninth. Brill (L, 0-1) got the first out of the inning, but fell behind Walker and paid for it when Walker lofted a solo homer over the scoreboard in left field to give Rancho Cucamonga the 5-4 lead. Dan Jagiello (SV, 1) struck out the side in order in the ninth to lock in Rancho Cucamonga's game-one win. They now need two more wins to claim their second California League Championship in the past four seasons. Varhso and Hernandez both put up multi-hit efforts for the Rawhide and Anfernee Grier provided a RBI. Smith with six innings for Visalia in the no decision, giving up four runs, three earned, on just four hits while striking out eight, one shy of his career-high. Visalia will play their final home game of the season tomorrow night with first pitch at 7 PM, trailing in the best-of-five Championship Series 1-0. Tickets are available now on rawhidebaseball.com.